"Agnes Dunbar" redirects here. For her niece, see Agnes Dunbar (mistress). Agnes, Countess of Dunbar and March (née Randolph; c. 1312–1369), known as Black Agnes for her dark complexion, was the wife of Patrick, 9th Earl of Dunbar and March. She is buried in the vault near Mordington House. She was the daughter of Thomas Randolph, Earl of Moray, nephew and companion-in-arms of Robert the Bruce, and Moray's wife, Isabel Stewart, herself a daughter of John Stewart of Bonkyll. 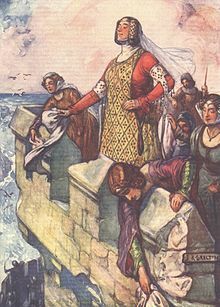 Agnes became renowned for her heroic defence of Dunbar Castle in East Lothian against an English siege led by William Montagu, 1st Earl of Salisbury, which began on 13 January 1338 and ended on 10 June the same year during the Second Scottish War of Independence from 1331 to 1341. "Of Scotland's King I haud my house, I pay him meat and fee, And I will keep my gude auld house, while my house will keep me." Women were known to take charge of castle or manor business while her husband was away in the Middle Ages and defend it if need be, but the stand of Lady Agnes is one of the best remembered instances. Salisbury's first attempt at taking the castle centered on catapulting huge rocks and lead shot against the ramparts, but this was met with disdain by Lady Agnes, who had one of her ladies-in-waiting dust off the ramparts with her kerchief. The English were employing an enormous siege tower called a sow in an attempt to storm the castle, but the countess simply advised Salisbury that he should "take good care of his sow, for she would soon cast her pigs, meaning his men, within the fortress." She then ordered that a boulder, which had been heaved on them earlier, be thrown down from the battlements and crushed Salisbury's sow to pieces. When one of the Scottish archers struck an English soldier standing next to Salisbury, the earl cried out, "There comes one of my lady's tire pins; Agnes's love shafts go straight to the heart." Unable to make progress through arms, Salisbury turned to craft. He bribed the Scotsman who guarded the principal entrance, advising him to leave the gate unlocked or to leave it in such a manner that the English could easily break in. However, the Scotsman, though he took the Englishman's money, reported the stratagem to Agnes, so she was ready for the English when they made entry. Although Salisbury was in the lead, one of his men pushed past him just at the moment when Agnes's men lowered the portcullis, separating him from the others. Agnes, of course, had meant to trap Salisbury, but she moved from stratagem to taunt, hollering at the earl, " Farewell, Montague, I intended that you should have supped with us, and assist us in defending the Castle against the English." At one point, having captured Agnes's brother, John Randolph, 3rd Earl of Moray, the English threw a rope around his neck and threatened to hang him if Agnes did not surrender the castle. However, she merely responded that his death would only benefit her, as she would inherit his earldom. She was not actually in line for the earldom, so either she was taking a serious gamble with her brother's life or the story is a later embellishment. As his last resort, Salisbury decided to isolate the castle from the roads and any communication with the outside world in an effort to starve the Countess and her garrison, but Ramsay of Dalhousie, who had earned a reputation for being a constant thorn in the English king's side, got wind of what the English were trying and moved from Edinburgh to the coast with forty men. Appropriating some boats, Ramsay and his company approached the castle by sea and entered the postern next to the sea. Charging out of the castle, the Scotsmen surprised Salisbury's advance guard and pushed them all the way back to their camp. "Cam I early, cam I late, I found Agnes at the gate." The failed siege of Dunbar had cost the English crown nearly 6,000 British pounds and had gotten nothing out of it. For centuries afterwards, Agnes's defense of Dunbar Castle caught the attention of contemporary chroniclers and Scottish historians due to her bravery and might. Some accounts describe her as Countess of Moray, on the assumption that she inherited the earldom when her brother John was killed at the Battle of Neville's Cross in 1346. However, the earldom actually reverted to the crown. However, in 1371/2, Agnes's nephew, John Dunbar, was created Earl of Moray by Robert II, his father-in-law. Agnes's family was active in Scottish resistance against the English attempts to conquer Scotland in the fourteenth century. Her father, Thomas Randolph, earl of Moray was appointed regent from 1329 to 1332. Agnes's brother became joint regent in 1335, but was captured by the English shortly afterwards. In 1324 Agnes married Patrick, ninth earl of Dunbar and March, governor of Berwick. When Berwick became occupied by English forces in 1333, Patrick decided to join the English, and Edward III granted Agnes and Patrick English lands. 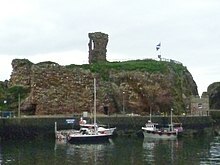 Patrick was given permission from Edward to refortify Dunbar Castle. Patrick switched back to the Scottish side. Agnes was deeply angry with her husband from him switching loyalties, but Patrick was also suspious of her. It seems that there were no surviving children of the marriage between Agnes and the Earl. Their estates were left to children of the marriage between the Earl's cousin John de Dunbar of Derchester and Birkynside and his wife, Isobel Randolph, Agnes's younger sister. She also had a ward, Agnes Dunbar, who became mistress of King David II. ^ Pennington, Reina (2003). Amazons to Fight Pilots. Westport, CT: Greenwood Press. p. 7. ISBN 0313327076. ^ Pennington, Reina (2003). Amazons to Fighter Pilots. Westport, CT: Greenwood Press. p. 8. ISBN 0313327084. ^ Kristen, Clive (2012). Ghost Trails of Edinburgh and the Borders. Luton, Beds: Andrews UK. Retrieved 26 Aug 2016. ^ Lawson, John Parker (1849). Historical Tales of the Wars of Scotland and of the Border Raids, Forays, and Conflicts. Edinburgh. p. 1:89. Retrieved 26 Aug 2016. ^ Lawson. Historical Tales. 1:89. ^ Lawson. Historical Tales. p. 1:90. ^ Lawson. Historical Tales. p. 1:90–91. ^ Pennington, Reina (2003). Amazons to Fighter Pilots. Westport, CT: Greenwood Press. p. 9. ISBN 0313327084. ^ Pennington, Reina (2003). Amazons to Fighter Pilots. Westport, CT: Greenwood Press. p. 7. ISBN 0313327076. ^ Stodart, R.R. (1881). Scottish arms: Being a Collection of Armorial Bearings, A.D. 1370-1678. Edinburgh. p. 19. Retrieved 26 Aug 2016. ^ Cokayne, George Edward (1893). Complete Peerage of England, Scotland, Ireland, Great Britain and the United Kingdom. London. p. 5:359. Retrieved 26 Aug 2016. ^ Cokayne. Complete Peerage. p. 5:360. ^ Pennington, Reina (2003). Amazons to Fighter Pilots. West Port, CT: Greenwood Press. p. 7. ISBN 0313327084. Chicago, Judy. (2007). The Dinner Party: From Creation to Preservation. London: Merrell. ISBN 1-85894-370-1.